Our objective in writing this book is to describe procedural advances enabled by developments in medical technology and assistive devices. Our objective in writing this book is to describe procedural advances enabled by developments in medical technology and assistive devices. Benjamin Franklin called man a “toolmaking animal,” and indeed it is within our nature to continuously improve the tools we use as labor-saving or (for our purposes) medical devices. Nerve block techniques have traditionally relied primarily on the landmark method in which surface anatomical features are used to determine the point of insertion. The practitioner’s judgment and experience is then used to determine direction to target, the feeling of the inserted needle through the fingers, the feeling of needle against bone, and estimation of depth. All of these factors are taken into account along with desired efficacy and potential risks. In other words, it is an extremely demanding procedure requiring long practice and experience to master. Advances in medical technology help evolve medical devices, including those which make nerve blocks more effective and safe than ever. For example, early-generation ultrasound devices used for guiding the needle in nerve blocks showed only fuzzy images of the needle. Recent improvements in both ultrasound and needles now show both the needle tip and surrounding anatomy clearly. Advances in X-ray fluoroscopy-guided method have reduced radiation exposure levels while also allowing images to be analyzed in detail in bright rooms. CT-guided nerve blocks mean that the anatomy and position of the needle can be visualized in real time during the procedure. The cost of nerve blocks is in general very low; the procedure itself is the major component of the price as the drugs used are inexpensive. Total cost for a nerve block is considered lower than long-term drug treatment. However, there are still many approaches to nerve blocks, and there is no book discussing best approaches for beginning practitioners to train with in order to attain mastery both rapidly and safely. 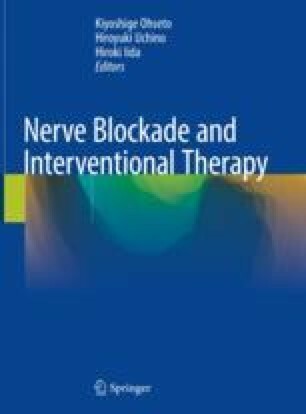 The Japan Society of Pain Clinicians has published interventional pain treatment guidelines, which are useful for making evidence-based choices among available interventional treatment methods, including nerve blocks. It is our hope that this book will only prove more valuable going forward, as multicenter clinical studies and joint research projects will require a reference for selection of safe and effective standardized procedures. Discussions of each nerve block procedure in this book are written by expert practitioners. Comments for each are then added by the supervisory editor for each section, with additional information such as technical tips and the best devices to use at each stage. This book was also planned to serve as a reference for doctors in other countries, as well as a tool for aiding mutual understanding among practitioners and a study book for exchange students. It may also be useful for doctors traveling overseas as a tool for demonstrating and performing procedures. To fulfill all of these objectives, we are now planning a series of accompanying videos on the Internet. Above all, we hope that this book will increase the safety and efficacy of nerve block procedures among current and future practitioners. We welcome any feedback about suggestions regarding the content of the book.